Beads will have plenty of fire and be clear of any major blemishes, each strand will have a varying display a shimmer and color. Labradorite is a plagioclase feldspar, in the same family as albite. Reflections of blue, green, violet and red are called labradorescence. The stone was originally discovered in 1770 on St. Paul Island in Labrador, Canada. According to Eskimo legend, the Northern Lights were once imprisoned in the rocks along the coast of Labrador. A wandering Eskimo warrior found them and was able to free most of the lights with a mighty blow of his spear. Some of the lights were still trapped within the stone, and today we have the beautiful mineral known as labradorite. Metaphysically, this gemstone is believed to slow aging. 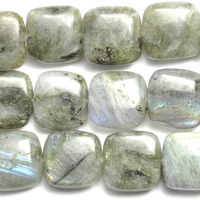 Labradorite 12mm square grey New! Labradorite 12 x 16mm nugget grey New! Labradorite 13 x 18mm oval grey New! Labradorite 13 x 18mm rectangle grey New! 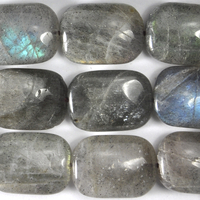 Labradorite 6mm cube grey New! 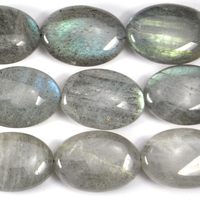 Labradorite 6mm round grey New! 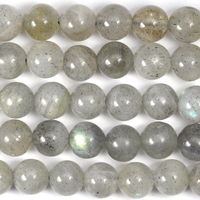 Labradorite 8mm round grey New! 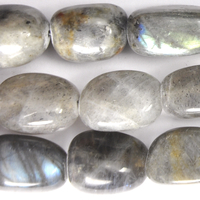 Labradorite 8mm faceted rondell grey New!